He was drunk. Well, asleep and drunk. And naked. And pruny. And seemed to have been shedding, previously. Julian Joseph had his shotgun slung in the crook of his elbow, just in case. But it didn’t appear as though his unannounced visitor would be waking up, let alone going anywhere, anytime soon. The steam wafting off the burbling surface carried the unmistakable tang of alcohol. But the man certainly wasn’t at risk of becoming dehydrated due to his inebriated state, considering that he was submerged up to his chin in Julian’s hot tub. Snowflakes fell gently, sprinkling what appeared to be a layer of finely dusted powdered sugar on the man’s abundant and matted facial hair. His head was cricked back on the ledge, and his mouth was slightly open. It’d been the racket—a wheezing sort of syncopated snoring—that had roused Julian from his warm bed inside. His warm, lonely bed. But the man in the hot tub most definitely did not represent the kind of companionship Julian had found himself longing for lately. Wrong gender, for one thing. Too young, most likely. Too hairy, without a doubt. Not to put too fine a point on it, but probably not of the appropriate socioeconomic caliber either. Particularly noted since the intruder had brought his own case of Hamm’s along. Empty cans were strewn on the deck, and one was clanking delicately against the tub’s overflow grate, eddied in an endless cycle by the swirling jets. Julian couldn’t think of the last time he’d drunk cheap beer. Probably during his college days. He was more of a Jack Daniel’s man, preferably Gentleman Jack. Something that packed a punch and numbed him quickly. But there hadn’t been much worthy of celebrating in that fashion lately. He bent, the lapels of his terrycloth robe gaping and letting in a bracing draft of frosty air, and snagged the furry nape of what was increasingly appearing to be a Sasquatch suit in the dim light cast through the bedroom window. He raised it aloft, letting the folds hang out, all the way to its mud-encrusted ankles. A pair of holey boots with additional filthy faux fur glued over the toes had been abandoned underneath, completing the ensemble. It was a practical joke not unheard of in these parts. To dress up like Big Foot and traipse about in the woods, hoping to scare the living daylights out of any backroad drivers or unfortunate hunters. But the prankster always ran the risk of being mistaken for a bear or an elk and being shot for supper, hunting season and appropriate permits notwithstanding. So his young visitor was lucky, in a way. Julian shook his head, folded the mangy suit over his arm, and trudged back inside. Sheriff Marge Stettler wasn’t in a good mood. Julian really couldn’t blame her. The luminescent hands on his bedside clock read 3:23 a.m. He could’ve dialed 911 instead of calling her directly, but what would’ve been the point? She’d have been awakened from an all-too-short sleep either way. “Did you go through his pockets?” she growled. Julian immediately regretted not having put on more clothes. The sensation arose like a throbbing, burning lump in the midsection of his esophagus—heartburn without the benefit of spicy food—and he found himself stammering inexplicably as he stepped out of the way. Because the woman in uniform standing on his doorstep was a stunner. And was most definitely not Sheriff Marge. A stunner in an odd sense that had almost nothing to do with looks. Petite. Hard—maybe unflinching was a better descriptor. Not in the least bleary-eyed in spite of the ungodly hour. Starched, pressed, with knife edges. Bristling with all the appropriate hardware. And regarding him coolly with a pair of crystal-green eyes. In a county where everyone knows everyone, he’d long since forgotten about the importance of first impressions. His bathrobe clearly wasn’t doing him any favors. He’d heard about the new undersheriff, of course. The whole county had. But there was a disorientingly gigantic difference between hearing about the woman and having her standing in front of you, glaring at you as if you were a culprit—for what crime she wasn’t sure yet, but sure as shootin’ she was going to figure it out and nab you for it. He realized, with a start, that he was somewhat unnerved. How else could he explain the weird flippy sensations in the pit of his abdomen? 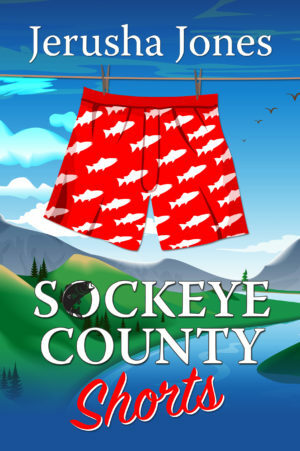 Jerusha’s Note: SOCKEYE COUNTY SHORTS is available now. You can click HERE to see the book on Amazon.com.